The Welsh Government has announced grants to local authorities worth £31.4m for transport schemes that aim to improve safety, create economic growth and promote active travel. almost £2m for road safety education and training programmes. The money was allocated following a competitve bidding process in December and January. Economy secretary Ken Skates said: ‘I’m delighted with the range of schemes I’ve been able to announce today and commend the high quality of applications we received across these grants. Mr Skates announced the funds the site of the Active Northern Corridor in Newport, a £1.35m project to improve active travel routes that connect northern settlements and urban areas to the city centre. The scheme started in 2015 and will be extended and completed with £1m Welsh Government funding. 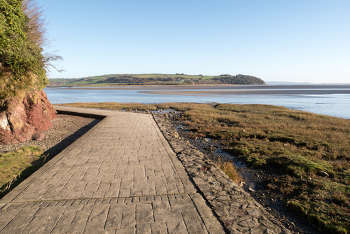 Carmarthenshire County Council is the biggest beneficiary with nearly £4.5m, including £1.5m for the Cross Hands Economic Link, an economic development scheme opening up land along the A48 corridor; £1m for walking & cycling linkages; and £865,000 for economic infrastructure in Ammanford. Caerphilly County Borough Council will receive £165,000 for bus stop enhancements. The £20m Local Transport Fund will pay for 46 schemes across 20 local authorities, while the Road Safety Capital Grant will enable delivery of 31 road casualty reduction schemes in 16 local authorities. The schemes target the locations and routes across Wales with the highest casualty and collision figures. The Safe Routes in Communities Grant provides £5.5m to fund 32 schemes to improve walking and cycling routes to schools in 19 local authorities. Funding of nearly £2m for road safety education and training programmes will target high risk and vulnerable groups such as children, young people, older drivers, and motorcyclists.